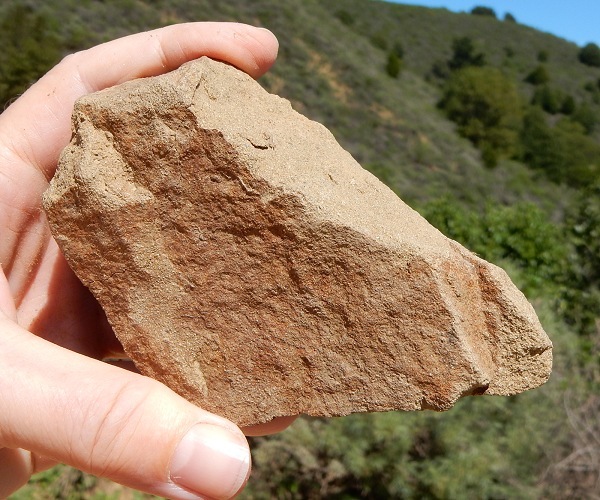 A few weeks ago I took a strenuous ramble to accomplish a small thing — returning a stone to its home. The journey took me through some beautiful and interesting country, and the whole thing was the point. The blue line of my route started from its farthest western point, where the 49 bus dropped me off by the Claremont Resort. From there I went up the ridge forming the northern side of Claremont Canyon, across the canyon’s upper reach to save time, and down the ridge on the southern side. 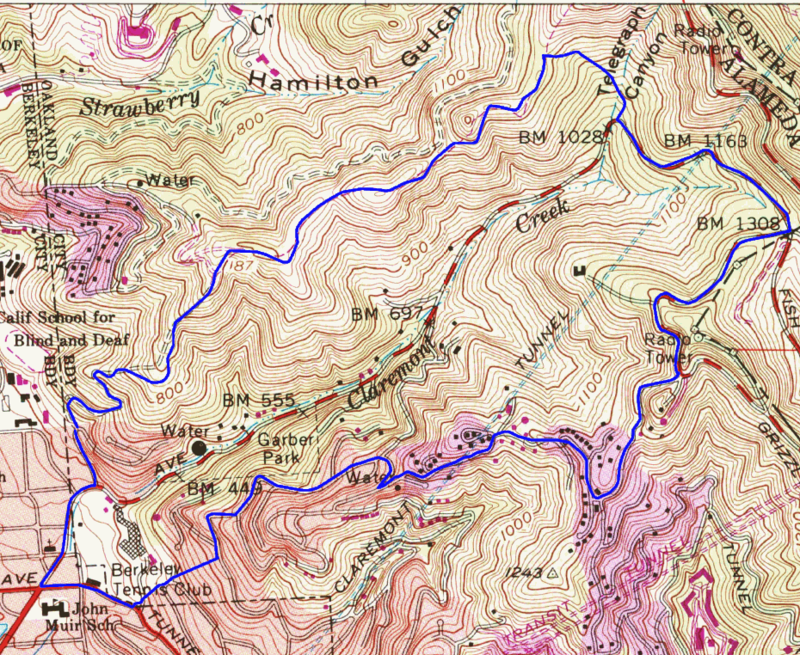 The elevation change was more than 1000 feet, so this was not an idle stroll. The canyon is one of our finest examples of a wineglass canyon, a landform typical of major faults, in this case the Hayward fault. 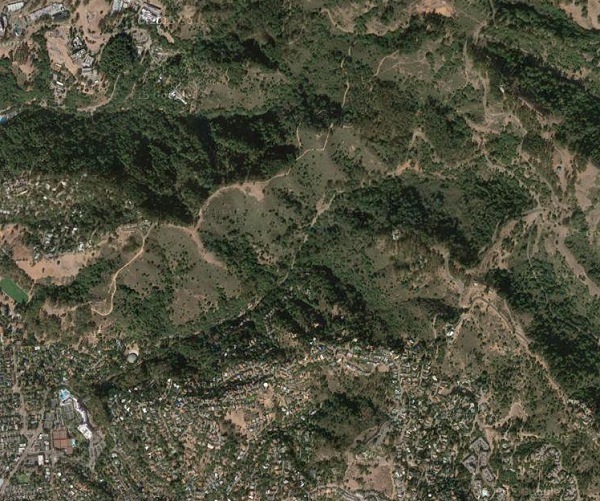 In case a photo image says more to you than a topo map, here’s a grab from Google Maps showing the canyon. 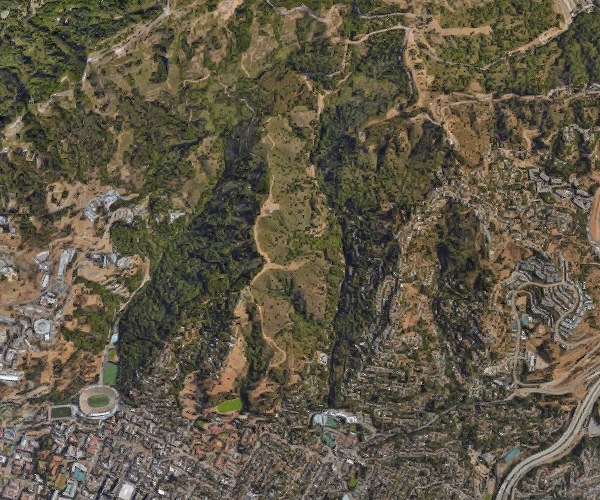 Now look at it in relation to the Hayward fault, which runs straight across the bottom of this image through Cal Stadium and right behind the Claremont Resort. 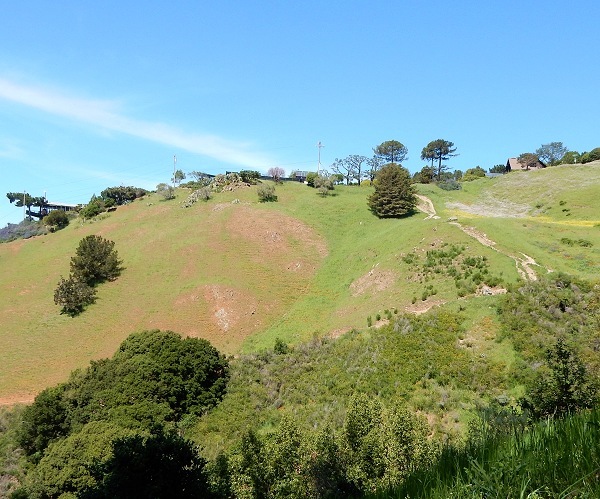 Movement on the fault has lifted the eastern (hills) side relative to the western (bay) side, which keeps Claremont Creek cutting down hard where it meets the fault. The result is that the mouth of the canyon is restricted to a narrow, steep-walled breach while the upper part of the canyon is free to spread out sideways as it erodes. This shape resembles the narrow stem and wide bowl of a wineglass, hence the name. OK, what about the rocks? 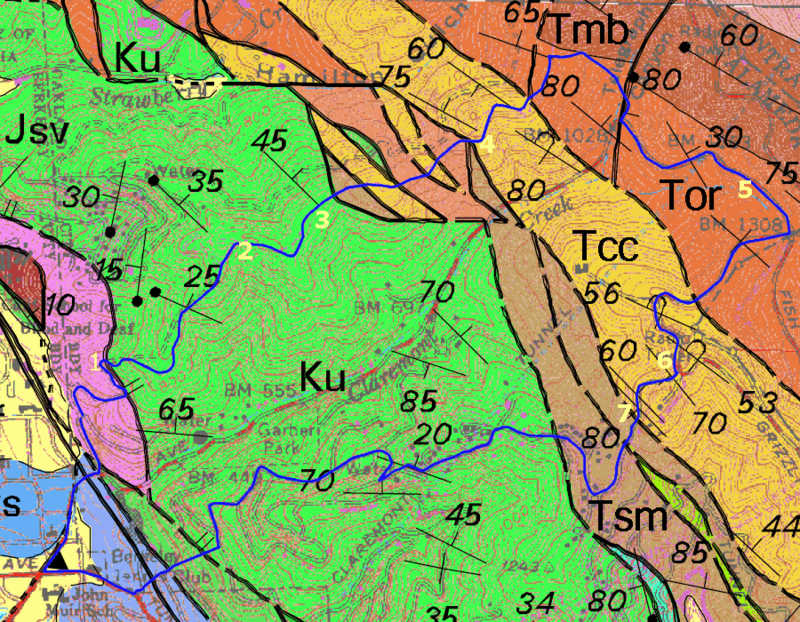 Here’s the geologic map with the photo localities shown. 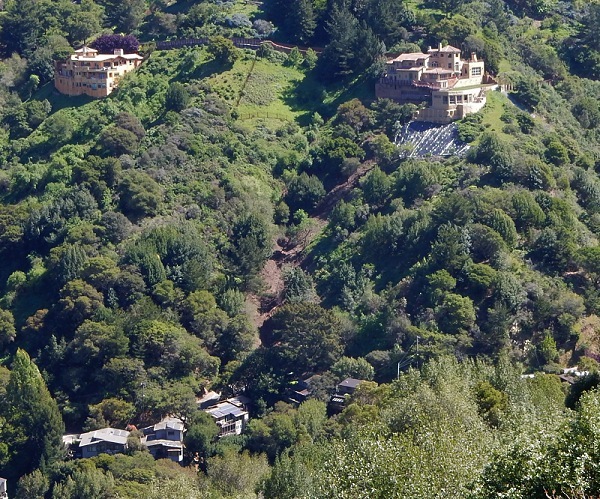 You see the Hayward fault cutting the lower left corner. We start out (1) through an unexpected little exposure of the Leona volcanics (Jsv), with the Chabot fault defining its eastern edge. Here’s the stone with its typical rusty tint . . .
. . . and here’s the view north of the dramatic contact between the Leona and, on the right, mudstones of the Great Valley Sequence (Ku, for undivided Cretaceous rocks). Higher up (2), the sandstone and related rocks of the Great Valley Sequence appear in abundance. 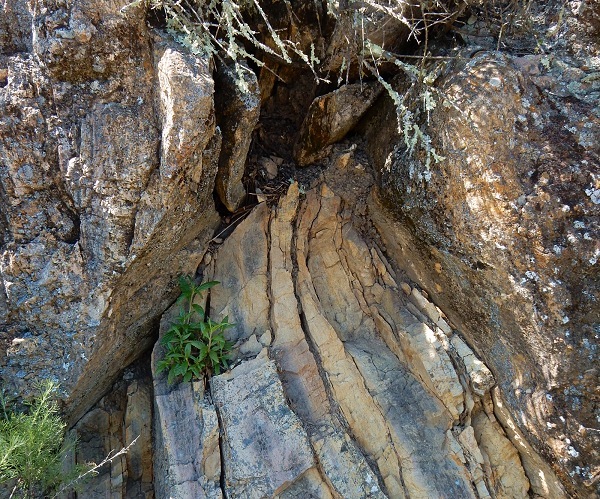 In Shepherd Canyon and farther south, these rocks are subdivided into several formations. The bedrock seems to support chapparal rather than forest, although maybe that’s only a function of the recent history of fire here. 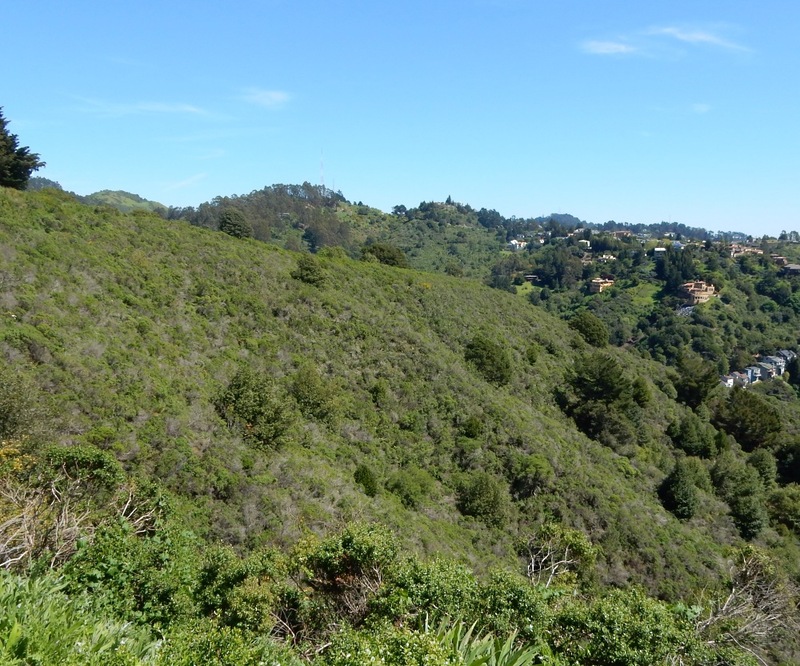 On the horizon, left to right, we see bare 1684 Hill, Radio Tower Hill and the adjacent knob across Grizzly Peak Boulevard, and dark Round Top just peeking over the ridgeline. Still higher (3) we can spot a fresh landslide running from a Grandview home down onto its neighbors. 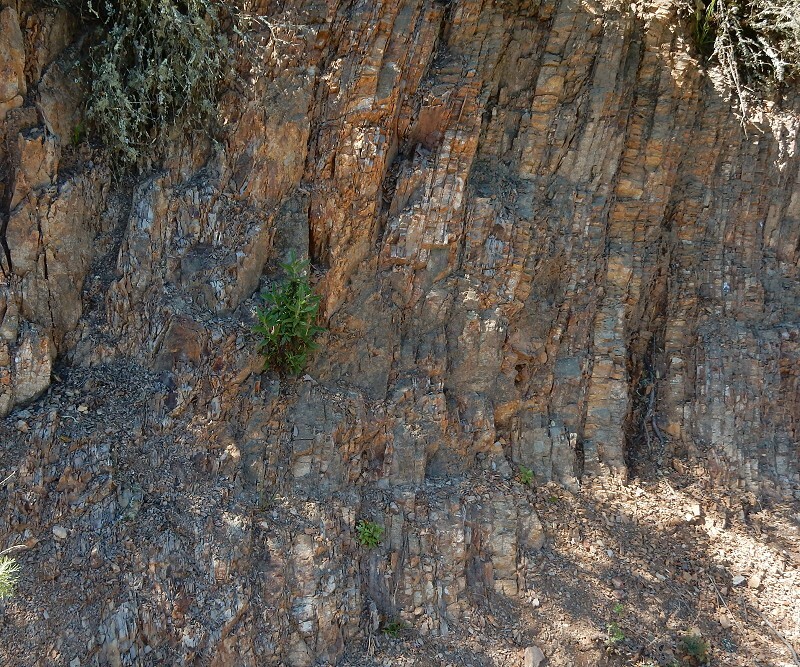 Up around 1300 feet (4) is this exposure of a fault that has pinched across these strongly bedded rocks. By now we’ve crossed a contact into much younger strata. 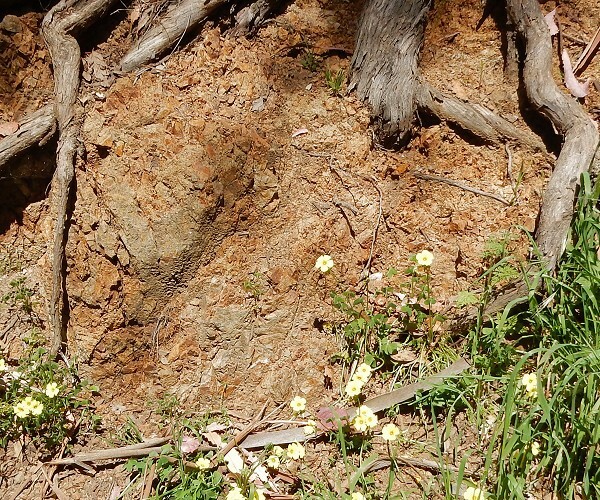 And right around the corner appears the Claremont Chert in all its typical glory. This is directly above the formation’s type section along Claremont Boulevard. 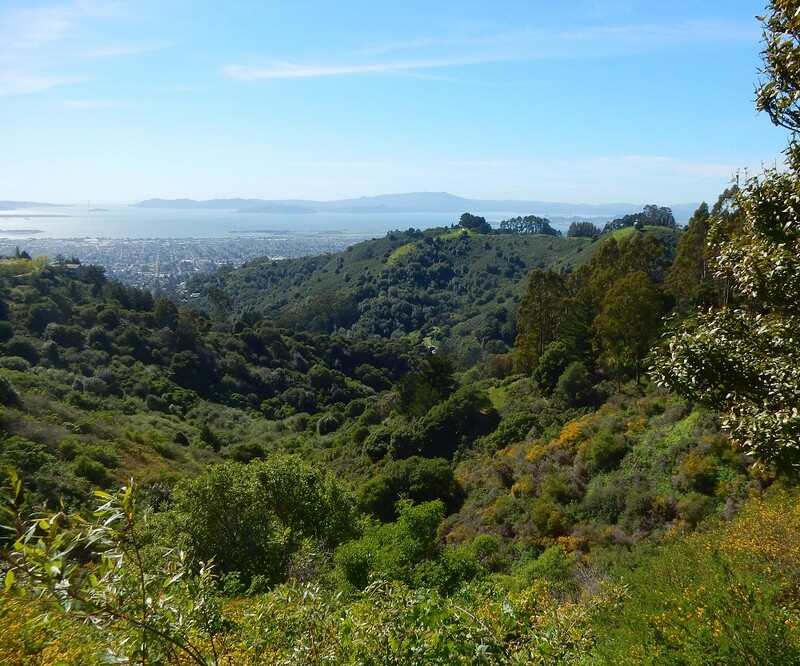 Achieving the top of the canyon (5) gets you the reward of one of Oakland’s finest views. 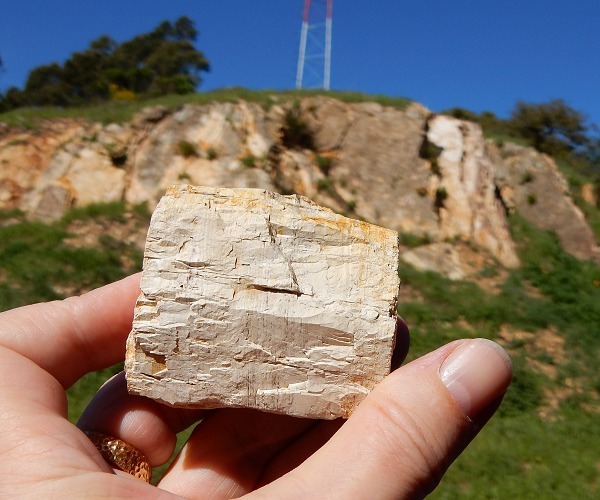 Finally I got to my destination (6), the exposure of Claremont Chert at Radio Tower Hill. That’s where I put back the specimen I collected there some 10 years ago. If you manage to find it, you can be its next temporary owner. The trudge back down will work your quads pretty hard, but you get nice views of where you’ve been (7). I hope it gets easier with repetition, because I want to come back. 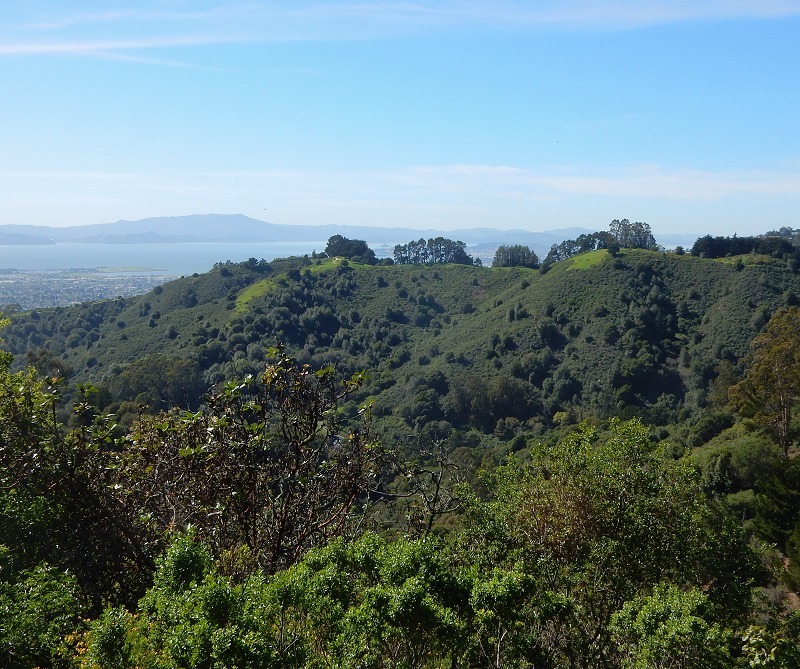 This entry was posted on 25 April 2016 at 8:02 am and is filed under Oakland geology views, Oakland geology walks, Oakland rocks, The Hayward fault. You can follow any responses to this entry through the RSS 2.0 feed. You can skip to the end and leave a response. Pinging is currently not allowed.